The 2017 Chevy Trax is a vehicle of sporty, yet sleek proportions. This crossover is large enough to tote around all of your camping gear, your monthly groceries, or your newest furniture find but still small enough to adapt to the active city lifestyle. The design of the interior is contemporary and stylish but also practical and comfortable. The seats come equipped with heat to knock the chill off in our hard Michigan winters. The back row of seats fold down easily to haul large cargo. Easily start your Chevy Trax with a push-to-start button. The Chevy Trax comes equipped with new and innovative technology to make your driving experience more enjoyable. The instrument panel display of the new Trax now shows a gauge cluster that displays an analog speedometer and a Driver Information Center that gives you information regarding all four tires, oil life, fuel range, and more! The 2017 Chevy Trax is easily connected to either Apple CarPlay or Android Auto to meet all of your entertainment and navigation needs. Your new Trax will also have built-in 4G LTE Wi-Fi so your mobile devices can seamlessly connect to your vehicle for ease of use. Turbocharged performance is standard in the new 2017 Chevy Trax. Your vehicle will come equipped with the EcoTec 1.4L turbocharged engine paired with an electronically controlled 6-speed automatic transmission. The fuel economy of the Trax is something to brag about – 33 MPG on the highway and 25 MPG in the city! Enjoy more time in your vehicle and spend less time at the gas pump! Advanced safety features in your new Trax will keep you and your passengers safe. Forward collision alerts are a continuous monitoring of the distance between you and the vehicle in front of you. This feature will alert the driver if they are following a vehicle too closely or if a front-end collision is imminent. Your Trax will also come equipped with a rear vision camera and a rear park assist feature to make driving in reverse a breeze. Visit Bowman Chevrolet to test drive the 2017 Trax and see all of its new and innovative features! View our 2017 Chevy Trax video here! As springtime thaw nears, James Bell shares tips and tricks for navigating the potholes that winter has left behind. The winter of 2013-2014 will go down as one of the most brutal, icy, frigid and snowy in U.S. history. From Denver to Boston to Atlanta and many points in between, Mother Nature has left “souvenirs” of her wrath in thousands of new potholes erupting up and down our roadways, and the resulting long lines at tire replacement shops and car dealerships around the country. On the personal side, while I live in mild Southern California, my job with GM takes me on many of the frozen and afflicted highways and byways in rental cars where I have had my share of BAM “what was that?? ?” moments, followed by breathless dread waiting for an indication that the unexpected pothole has graced me with an unexpected flat tire…or bent wheel…or worse. With these experiences seared into recent memory, I was excited to (cautiously) head out to GM’s Milford Proving Ground in Michigan to experience the “depths” Chevrolet, Buick, GMC, and Cadillac go through to make sure drivers are provided with confidence that their GM vehicles are prepared to take on even the most evil potholes. While the extreme laws of physics prove difficult to ultimately defeat, I was impressed by the repeated “beating” we administer to our cars and trucks while in development and certification. And I have to admit it was also a lot of fun to do some pothole testing of my own – in a vehicle that I do not own, of course! If you hit a pothole, and feel there may be damage, pull off the road into a safe place where you can get out and visibly check your wheel and tire for obvious damage. Then, have your dealer check to see if the vehicle needs a re-alignment or if there is suspension damage. In an emergency, if you have a GM vehicle with an active OnStar subscription, you can always press the “OnStar” button to ask an Advisor for assistance. The Chevrolet Traverse mid-size SUV has enough cargo room for more than 50 pies – and that’s just behind the third row. In celebration of Pi Day, a day noted by math enthusiasts on Friday, March 14, 2014 (3/14) for the mathematical constant Pi, Chevrolet delivered fresh baked Grand Traverse Pie Company ABC pies (with Michigan apples, blueberries and cherries) using 2014 Chevrolet Traverse mid-size SUVs throughout southeastern Michigan. All Grand Traverse Pie Company locations offered customers a free slice of pie with any purchase as part of a statewide celebration of Michigan’s food and agriculture businesses that prosper due to the state’s quality education opportunities. The Michigan Department of Agriculture and Rural Development is sponsoring the celebration. All in all, Grand Traverse Pie Company plans to give around 10,000 slices of pie away for Pi Day! Back in 2006, Andy Grignon had left his printed out directions for his meeting at the office and he was already en route to his destination. So he picked up his prototype phone and looked up his route on Google Maps. It was this “aha” moment when he realized that the top-secret project that would become the iPhone in 2007 would change the way people live. Grignon was a key member of the team Steve Jobs assembled to create the iPhone, which did almost instantly revolutionize the way the world communicates. But the App Store, and even the concept of mobile gaming, weren’t part of the initial blue print for the device. These types of insights were shared by Grignon in front of a packed audience at the Chevrolet Tweet House at SXSW 2014, which was held at Mellow Johnny’s bike shop in Austin. Grignon has teamed up with Apple alums William Bull, who designed the iPod Classic, and Jeremy Wyld, who launched iOS, iPhone and iPad; to create the next big thing in social media. He offered an exclusive sneak peek of his start-up, Eightly, at the invite-only event. Eightly has been designed to seamlessly allow anyone – with absolutely no programming or Web site creation experience – to instantly build out interactive channels filled with photos, videos, audio and text. Grignon’s team has designed the Eightly Experience Engine, which is the foundation on which every individual’s story will be built. The key to the mainstream success of this new operating system is its use of pictures and symbols to quickly build out channels around anything, whether it’s a unique take on New Orleans Cajun cuisine via photographs or a video series that explores the latest technology innovations from Austin, TX. And it only takes minutes to achieve today what it might have taken hours or days for professionals to accomplish yesterday. Grignon has watched social media explode – in large part because of the smartphone revolution he helped spark – as everyone instantly shares pictures, videos and thoughts with the world through outlets like Twitter, Pinterest, Facebook, Google+ and Vine. But what he believes is missing from this socially connected society is true creativity. With Eightly, if you can dream it, you can bring it to life. It’s as simple as pointing and clicking to build out feature-rich, interactive experiences that celebrate every aspect of life. Eightly fit in nicely with SXSW 2014, as start-ups in gaming, technology and new business were a key focal point for the convention. Grignon’s newest venture also connected with the dawn of 4G LTE vehicles. Chevrolet showcased a 2014 Impala, equipped with 2015 technology, that features high speed Internet, which will drive off assembly lines this summer. The ability for connected vehicles to provide passengers instant access online will allow future Eightly users to use laptops, tablets and even smartphones to share their lives through personal channels from the road. John Gaudiosi is editorial director for shacknews.com. As a seasoned games journalists who contributes to Fortune, CNN, Money, AOL and Gamerhub.tv., John has covered the world of video games for nearly 20 years. Today, we’re sharing the history behind two more of the eight vehicles damaged in the sinkhole at the National Corvette Museum – the 1 millionth and 1.5 millionth Corvettes produced. The 1 millionth Corvette was built around 2 p.m. on July 2, 1992, at the Bowling Green Assembly Plant. Like the very first Corvette built in 1953, this one was a white convertible with red interior. More than a year before the 1 millionth Corvette rolled off the assembly line, it was determined that it would be donated to the Corvette Museum Foundation in Bowling Green, Ky. The following summer, the nation’s top Corvette dealers were invited to bid on the “million plus one” 1992 Corvette. All proceeds above the sales costs would be donated by Chevrolet to the National Corvette Museum. Chevrolet dealer Marshall R. Chesrown of Denver made the highest bid and received the keys for Corvette No. 1,000,001 from then Chevrolet General Manager Jim Perkins. 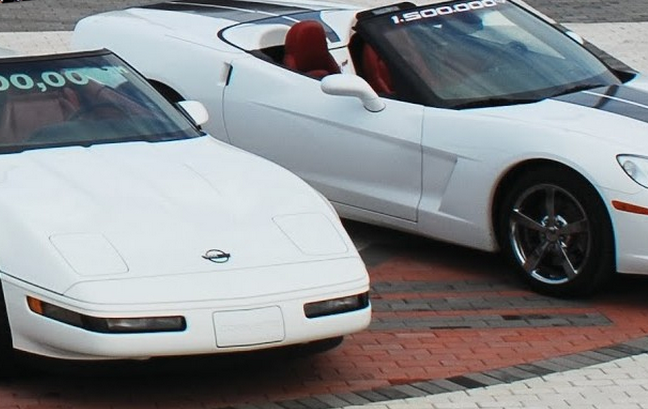 This car had rolled off the assembly line immediately after the historic 1 millionth Corvette and was nearly identical as it was a white Corvette with black top and red interior. The 1.5 millionth Corvette was built on May 28, 2009. While the weakening economy was clearly on everyone’s mind, there was still an excitement in the air at the Bowling Green Assembly Plant as the white Corvette with red interior made its way down the production line. Like the 1 millionth Corvette, this car features a similar paint job and interior to honor the first 300 Corvettes built in 1953. As the car before the 1.5 millionth Corvette came down the line, GM workers got ready to pose for photos with the history-making car that was just behind it. While they might have been thinking about the economy, at that moment they were standing behind the product they so proudly built. Through 11 presidents, four wars, gas shortages, stock market crashes and rebounds, 1.5 million Corvettes had rolled off the line – all of them built in America. 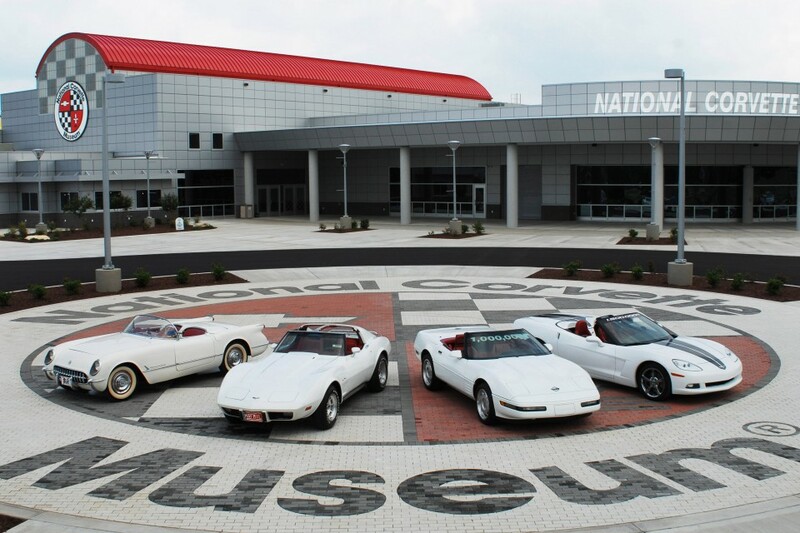 For information on the efforts being made to restore these historic Corvettes, visit the National Corvette Museum’s website. You also can see a live stream of the Skydome restoration.